The Sumela Monastery or as it is well-known, the Meryem Ana (Virgin Mary) Monastery stands on the foot of a steep cliff facing the Altindere valley in Maçka - a province of the city of Trabzon. 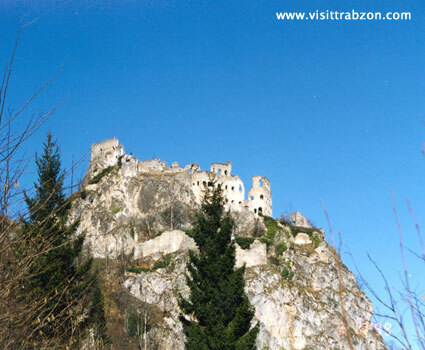 The building is about 300 high from the valley and is an example to the tradition of building monasteries outside cities, in forests, in caves, and near sources of water. The monastery was founded in honour of the Virgin Mary and it is believed that its name comes from the word “melas” which means “black”. Although it may be said that the name derived from the name of “Karadaglar” ( Black Mountains ) on which it is built, the name can also be associated with the black colour of the Virgin Mary icon. The colour of the icon, which is so dark that it could be described as black, was one of the things that struck the eminent historian J. P. Failmerayer (1790-1 861) when he visited the Monastery in 1840. It is possible that this could be the origin of the name. it is known that the 12th century Georgian Art produced a number of Virgin Mary icons known as Black Madonnas, and that these icons found their ways into a number of monasteries. The main source of income of the monastery is an icon of Virgin Mary, which is reputed to be of great age and believed by many to possess miraculous properties. According to the legend, which is believed to have been invented in order to make people believe that it is very old and therefore increase the income of the church, the icon is the work of St. Luke, one of the disciples of Jesus Christ, and it went to Athens after St. Luke's death. However, in the reign of Theodosius (4th century), the icon desired to leave Athens , and one day it was brought by angels to its present place and placed upon a stone in the mountains around the city of Trabzon . At around the same time, Barnabas and Sophronios, two monks who travelled from Athens to Trabzon , happened to find the icon in this deserted spot, and they had the main rock grotto built here. Then, in the 6th century, it was restored and enlarged by general Belisarius at the behest of Emperor Justinianus. According to another legend, Alexios III was sayed by Virgin Mary from a place built and donated rich foundations. Later on, Chrysobullos set out sturdy principles for these foundations in a decree. A verse consisting of five lines inscribed on a tablet dated 1360, which remained over the monastery gates until 1650, states that “Alexios III, founder of this place, is the emperor of the East and West ( Iberia )”. In 1361, Alexios witnessed an eclipse of the sun here at Sumela. The sun depicted on the coins minted by Alexios is considered to refer to this event. In the Deed of Foundation dated 1365, as well as references to the administration, land and income of the monastery there is a warning about the “danger of a Turkish invasion of Trabzon ” and the monks are urged “to be always on the alert”. According to scientific investigations, the foundation of the monastery goes as back as to the 13rd century. Shortly, the Sumela Monastery was first referred to by this name in the Comnenos period which started in 1204. The monastery gained importance during the reign of Alexios III (1349-1390) of the Comnenian Empire of Trabzon . Its income was assured from the imperial funds. 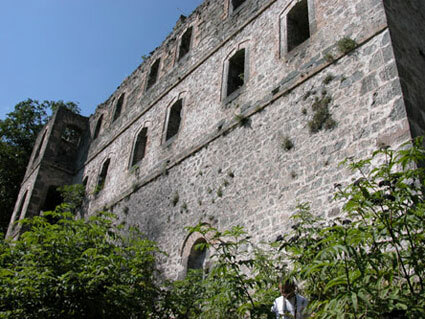 Following the conquest of Trabzon and the surrounding area by the Ottomans, the sultans issued decrees protecting the ancient rights of the monastery are known to have been presented by Sultan Selim I (1512-1 520) a decree issued by Sultan Mehmet II, conqueror of Trabzon, acknowledging that the rights of the monastery existed. It is known that other sultans such as Bayazit II, Selim II, Murat II, Ibrahim, Mehmet IV Suleiman, the Magnificent, Mustafa and Ahmet III also issued decrees for the monastery. During the 18th century, many parts of the monastery were restored and the walls were decorated with frescoes. In the 19th century, the monastery took on an impressive appearance with the addition of larger buildings. This was the monastery present form and it attracted many foreign travellers who mentioned it in their writings. Among them were Ghikas (1755), Stephane (1764), Hypsilantes (1775), and G. Palgrave (1826-1888). The monastery was seized by the Russians during the and 1918, and then, in 1923, it was abandoned. 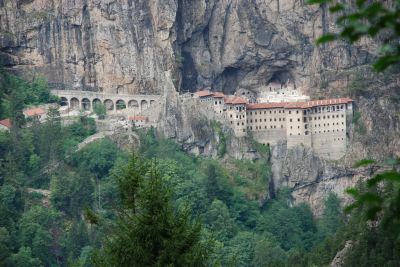 The main sections of the Sumela Monastery are the rock church, a few chapels, kitchens, student rooms, a guesthouse, library and a sacred spring. This collection of buildings was built over a very large area. The large aqueduct at the entrance, which supplied water to the monastery, is constructed against the side of the cliff. The aqueduct has many arches and is now mostly restored. A long and narrow stairway leads to the entrance of the monastery. Next to the entrance are guardrooms. Another stairway leads to the inner courtyard. On the left in front of the cave, which forms the main part of the monastery and which was turned into a church, are different facilities. The library is on the right side. Sixty-six of the mainly 17th and 18th century manuscripts had been previously catalogued and are now displayed in Ankara Museum . A further 1000 tetraevangeliums (the four gospels) adorned with miniatures and dating from Byzantine times are kept in the Ayasofya (Hagia Sophia) Museum in Istanbul. Also there are about 150 printed books. Of the valuables from the treasury of the church is a silver cross (stavrotek) presented by Manuel III, prince of Trabzon, a hand-written manuscript and a large number of documents which are now in the Museum of Byzantine Works in Athens. An icon of the monastery known as “Lady of the roses” is now in the National Gallery in Dublin . The silver candlesticks presented by Sultan Selim were stolen in 1877. Another icon is in a private collection in Oxford . A silver medallion on which the holy trinity is depicted and another ornate medallion dated 1438 together with an altar cloth (epitaphios) dated 1438 are in the Benaki Museum in Athens . The large building with a balcony on the front port of the cliff was used as the monk cells and guestrooms. The building dates to 1860. The influence of Turkish art can be seen in the design of the cupboards, niches and fireplaces in the rooms of the buildings surrounding the courtyard. Thus, these details in the rooms gave these small interior spaces a positively Turkish house air. The inner and outer walls of the rock church and the adjacent chapel are decorated with frescoes. Frescoes of the time of Alexios III can be seen on the inner wall of the rock church facing the courtyard. The frescoes of the chapel are dated to the early 18th century and they were painted at four levels in four different periods. The frescoes of the bottom band are better than the others in terms of colour and quality. The change in subject matter discernible in each layer is interesting. Inscriptions stating that these works were done in 1710 and 1732 were discovered. 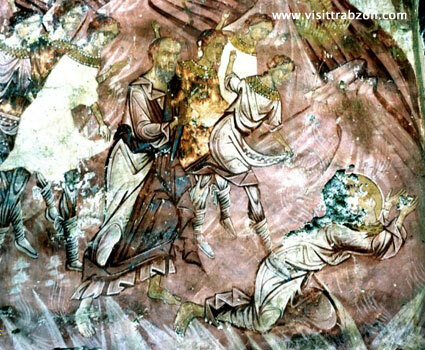 But frescoes dating from the times of Alexios III had been found on the wall of the rock church facing the courtyard. There, on each side of Alexios III were his sons, Manuel III and Andronikos. Unfortunately, no traces of these portraits remain today. Outside, parts of a huge apocalypse scene, of which only upper bands remain, can be seen on the rock face, and underneath its flaking plaster other scenes were found. 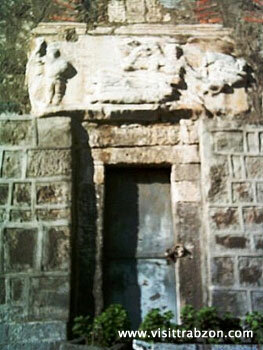 A dragon and two mounted saints (Georgios and Demetrios) are seen on the wall of a small chapel. It was found that there are three other layers of paintings beneath this layer. Thus, on top of the bottom layer, the figure of an emperor wearing a diadem is depicted, and yet another figure of the same kind is depicted on top of that figure, and on top of this is a Transfiguration scene-Metamorphosis, the change of the look of Jesus Christ on Tabor mountain. In this case, in the older parts of the monastery where the plaster has not faked off completely there should be valuable paintings in the lower layers. With its pointed arches, the fountain which accumulates the sacred water is Turkish in character. 100 metre north of the monastery are chapels which are also carved into mountains having walls with frescoes. The Ministry of Culture and Tourism has been carrying out a major restoration project at Sumela since 1998, and so far al the damaged walls have been cleaned, restored and reinforced. The main building was covered with a roof and the frescoes in the main rock church have been strengthened. And finally, the path leading to the monastery was widened without giving any harm to the natural texture. The monastery stands on an area which overlooks the Degirmendere Valley in Boztepe Neighbourhood, 3 km to the southeast from Trabzon. It was built in 1424. The building complex lies on a rectangular area including a church in the middle with single apse, a bell tower to the northwest, and a small chapel and monastic cells to the southeast. All these buildings within the monastery have experienced a number of repairs. Hexagonal apse of the church is the oldest remain on the area. Frescoes decorating the church date back to the 18 century. Being one of the oldest churches in the city, Saint Anna Church is in the shape of a basilica with three naves which are round on both inside and outside. The church does not include any narthex. On its ground, there is a crypt. Two T-shaped pillars and two columns with Ion capitals are seen in the church. Over the entrance gate are a Byzantine relief and an inscription informing that the church was repaired in 884-885 during Basil the 1st. Fresco remains from later periods are also seen in the church. It is known as Peristera. This Monastery was built nearby the Simsirli village in Maçka district in the middle of the 8 century. Only the base of the church has survived to the present. The monastery is located among pine trees, 7 km west from Kiremitli village in Maçka district. On the area, there is a cave and a water spring. The monastery was first built in front of the cave. Church and the rooms of the monks in front of the cave which has survived to the present date back to the 19 century. 9 km far from the complex is a chapel which stretches back to the 15 century. It includes precious frescoes.